If you’ve lost teeth over time, a dental implant is a tooth replacement method you really should consider. The implant is a tiny titanium post that gets inserted in the jaw and connects to a dental crown, which replaces the lost tooth. Learn the biggest five reasons why it’s worth getting a dental implant. Believe it or not, a dental implant is as strong and secure as natural teeth because it’s inserted deep in the jawbone. And with the convenience of same day dental implants, your smile can be greatly improved in a matter of hours. Once the tooth replacement has had a few months to fuse to your jaw, the dental implant will feel completely natural and allow you to smile, eat, and talk with complete confidence. Dental implants offer a permanent tooth replacement option since they bond with your jawbone. This allows them to last more than 20 years with proper care and cleaning. 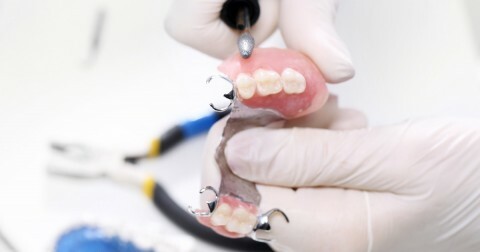 In comparison, other options like removable dentures and bridgework typically need to be replaced or remade every few years. Even though the cost of dental implants is often higher than other options, their permanence makes dental implant costs more affordable in the long run. A dental implant’s placement in the bone eliminates the need to stress the surrounding teeth. Yet other tooth replacement options must be supported by those teeth, which can cause them to weaken and decay. This can lead to the need for costly dental repairs and treatment, which further proves the value of the cost of dental implants. Plus, the need to depend on adjacent teeth makes other tooth replacements prone to slippage and discomfort, where a dental implant is comfortable and secure. Once you lose a tooth, you greatly increase your risk of also losing dental bone because the bone starts to melt away without a tooth in place. This can change the shape of your face and increase your risk for dental fractures, which are additional reasons why dental implant costs are worth it. Simply replacing missing teeth with a dental implant can stabilize your bone and help you avoid these awful problems. And choosing same day dental implants soon after you lose a tooth can reduce your risk completely because the tooth has been replaced in the bone. Keeping a dental implant in top condition merely calls for the same care and cleaning as you would give your natural teeth. Simply brush at least twice a day, floss on a daily basis, and get regular dental check-ups and cleanings. In contrast, other tooth replacement options require soothing creams or soaking overnight, which are messy and inconvenient. But using the same good oral hygiene you use on natural teeth will keep your dental implant looking and lasting its best. To get the dental care you deserve from an affordable dentist in Shelton, call Huntington Family Dental Group today at (203) 916-1173 or make an appointment. Huntington Family Dental Group offers affordable family dentistry and gentle, compassionate dental care in Shelton. Our office is conveniently located with extended hours to meet your needs. At Huntington Family Dental Group, we provide most dental services, from basic preventative care and general dentistry to specialized procedures and complete dental reconstruction. We accept most dental insurance plans and offer affordable financial solutions for any budget. Patient satisfaction is our top priority and we strive to provide the exceptional, affordable dental care and personal touch that lead to lasting relationships. A smiling patient is our greatest reward and we look forward to keeping those smiles healthy, beautiful, and bright. Discover an affordable dentist who truly cares at Huntington Family Dental Group. Which Kinds of Dental Crowns Are King? Very professional, very friendly and i would recommend to anyone i see! Very through. Great place, great people! Choice of rinse flavors! Very positive experience!! Went in a little nervous for two crowns, and, thanks to Dr. Sal and Laura, came out “a happy camper”! I was very impressed with all the personal attention and the up to date technology. Everyone was great!